"Let this compass navigate you through life's twist and turns and guide you to fortune and love." A couple of weekends ago I traveled to Nashville to hang out with two special people. They've been in my life since the seventh grade. (I will not be disclosing how long ago that was...) We did the normal girl stuff: ate great food, talked without ceasing, and did a little shopping. Our favorite girls' weekend purchase hangs on our arms in the picture - our compass bracelets. We found the bracelets at a boutique called Pieces. We were hunting for a trinket to remind us of our getaway and our friendship. The bracelets fit the bill perfectly. They were created by Lucca + Danni, a family owned company "born out of the simple yet powerful belief that dreams can come true." Read their story here and look through their other designs here. They have beautiful, original work at really reasonable prices. 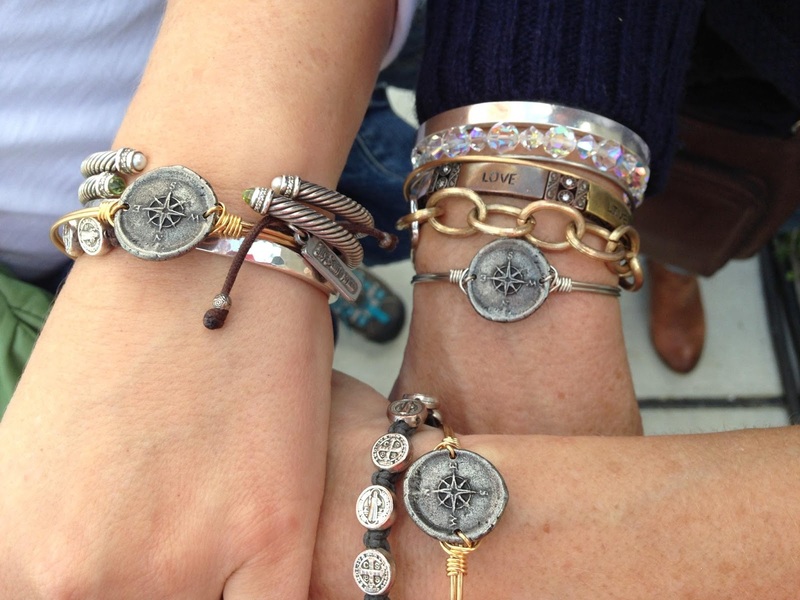 You can view the compass bracelet here. I think you will like Lucca + Danni as much as we do.